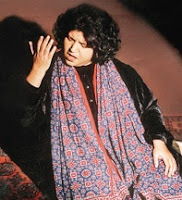 Known in global music circles as the "Uncrowned Sufi Queen", Abida Parveen’s inimitable Qawwali sound burrows its way into the soul of the listener, drawing upon love and emotion. She is one of the best contemporary Sufi singer of our time. She is from Pakistan, but her access to win the heart and mind of people is not limited to any political boundary. Recently she was addressing on the topic of “Spiritualism” under Aga Khan University’s Special Lecture Series. Abida began her lecture by stating that spiritualism had no theory, it was a direct connection that Man (and woman) shared with his (or her) Creator. “It’s a direct dialling relationship. Spiritualism is a light that Allah put in man’s heart at the time of his creation,” she explained, saying that the warmth of that flame was inexplicable except for the person who felt it in his heart or that force which had put it there in the first place. According to Abida, the spirit was eternally in search of uniting with the Absolute, the only experience that could complete it and help it ascend to the spiritual level that every man yearned for. “To allow one’s spirit to soar that high, one should practice humility and submission so steadfastly that all that remains of this is those very traits,” she said with much force. “Sufism has no complexities within; it is as simple as love itself. Love teaches selflessness and without losing self one cannot find Allah,” she said. “Sufism is grief and sacrifice that purify soul and strengthen forbearance of the one who surrenders his being entirely,” she said citing the example of fire that burns and qualifies to give light. “It (Sufism) is just like fire and those who are burnt by this fire could learn the ultimate truth,” she added.